I just got my a580 converted with the 665nm filter. These are a few of the better shots from my first time out with it. 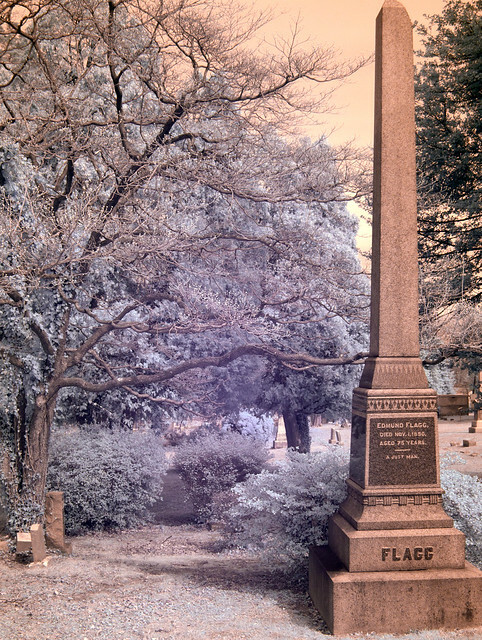 I'm brand new to IR post-processing, so any comments and/or criticisms would be greatly appreciated. Cheers! Hi Dimo, welcome to Photoclubalpha . I'm not an IR expert, but those shots look great to me. I've always imagine people getting older models converted to IR so with a converted 580 you must be taking this IR stuff pretty seriously ? Looking forward to seeing more of your pictures. Pretty daring to go IR with the A580 indeed. Nice photos for a start. Thanks for the welcome =) I don't know if it was daring or foolish, but I came across some IR images a couple of months ago that just spoke to me and I've been hooked ever since. Luckily I had some Canon gear I hadn't sold off yet that (mostly) offset the cost of the 580. I'm happy to have found this board! Your images are beautiful! I hope you'll share more with us. converted with the 665nm filter. means he just put the IR filter on! Those are some beautiful IR shots. Good subject choice which is so important for good IR. As others said- I can't wait to see more. Maybe it is time for an IR thread????? I actually did get the camera body converted with a 665nm IR filter replacing the hot pass filter. I've never actually tried shooting IR using filters on any of my Alphas, but from what I've read the Sony hot-pass filters are too strong for IR filter photography. The conversion also allows for normal exposure times- the shots above were both hand-held at 1/160 and 1/200 respectively. I stand corrected. And - WOW you did that to a new camera? You must have money to burn! (or REALLY like IR). I can't lie, it's a real joy to shoot with John. The 580 is a pretty sweet camera for the price, converted or not. I got my conversion done at Spencer's in Utah- Can't recommend them highly enough if you want to make the leap. They were easy to work with and did the job in less time than they estimated. Excellent shots. Can I ask you this - with an IR filter in front of the lens, a focus shift has to be applied and phase detect focusing is not accurate enough. With the IR filter over the sensor, what is the effect? I am considering having an A100 converted by ACS in the UK (£250), but the A100 lacks live view. I would assume that totally accurate focusing with IR imaging must be done using live view and magnified manual focus. Is this correct - or at least, is this the way you are doing it? The place I got my conversion done calibrated the auto-focus as part of the conversion process. Both of the above shots were taken hand-held using the AF. I've since done a couple of tests off a tripod with a shutter release, and to be honest I can't tell much of a difference between my best attempts at manual focusing and the AF. However, the metering system doesn't function as well in my converted camera as it did before, and without live view it would probably take of a bit of guesswork to get a correct exposure.